The forecast remains largely on track. Temperatures are dropping into the mid 30s this evening with several hours of precipitation to move through. Though they are not far from freezing at the surface, there remains a bit of warm air aloft as well that is keeping precipitation from changing to anything wintry just yet. Within the next few hours, some sleet could mix in, particularly in far northern areas of the metro (i.e., mainly Tipton Co). That area will also be the first to reach freezing tonight and a changeover to light freezing rain is expected, probably between 10pm-midnight. Temperatures are expected to hold for several hours overnight in the 32° (north) to 35° (south) range with the potential for a light wintry mix as far south as the the immediate metro as we head into the early morning hours (2-5 am). By sunrise, most precipitation will be gone, but lingering very light precip will likely be in the form of snow flurries or freezing drizzle through about 9-10am in TN portions of the metro. Overall, Tipton County stands the best chance for up to 0.10" of an ice glaze on exposed surfaces and bridges. Very light icing will also be possible in Crittenden, Shelby and Fayette Counties by morning. As stated below, "wait and see" is the best approach for morning travel. I expect the primary roads will be OK, but elevated roadways could be slippery. Treatment has not been applied ahead of time due to the constant rain before it changes over, so any road treatment will have to wait until the ice forms. 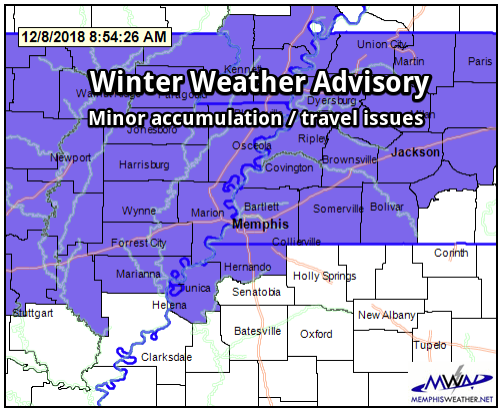 Earlier this morning, the National Weather Service - purveyor of all watches/warnings/advisories - extended a Winter Weather Advisory south into the I-40 corridor, a.k.a. the Memphis metro along this part of I-40. What does that mean for us? Let's answer your questions. The NWS issues a Winter Weather Advisory when a winter weather event is expected to cause a some degree of inconvenience, but is not expected to be a major hazard to travel and commerce (when a warning would be required). 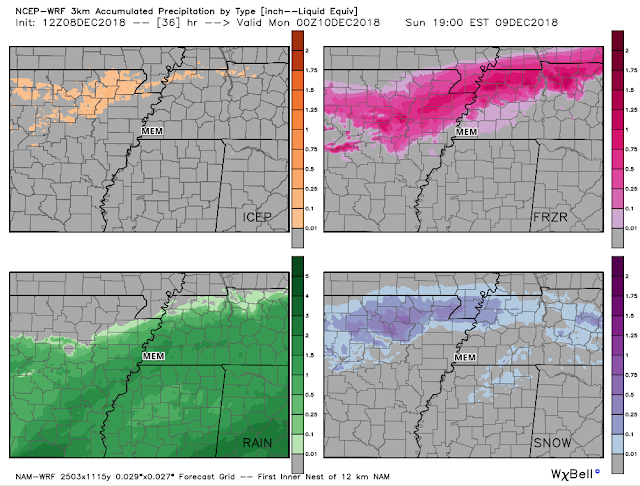 A combination of precipitation types is possible. An Advisory is basically a "Junior Warning." Caution is advised while traveling or working outdoors during an advisory. When is it in effect and who does it include? The advisory is in effect for those counties in purple above. Basically if your county has I-40 running through it or you are north of I-40, you're included. In addition, DeSoto and Tunica Counties are also included. The advisory runs from 6pm this evening through 9am Sunday. What is driving this potential winter weather? A fairly common wintertime pattern is in place, with a low pressure system moving along the Gulf Coast over the next 24 hours and an "inverted trough" (or weaker pressure extending north from the low) crossing the Mid-South. The low and trough are providing the lift and precipitation. Cold high pressure to our north is seeping the cold air into the region. Areas to the north of the metro, in northeast AR and northwest TN, are deeper into the cold air and are already experiencing winter weather conditions, including freezing rain, snow and some sleet. As the Gulf low and trough move east tonight, the colder air will wrap in behind them, dropping south into the I-40 corridor. That will be the impetus for today's rain to change over to freezing or frozen precipitation. The kicker (there always is one, and it's the same as usual in these scenarios) is that precipitation will be departing late tonight as the cold air arrives. So what can we expect in the metro, and when? Rain today. Cold, yucky, hot chocolate-sipping, wintertime rain. After midnight, and likely closer to 3am, surface temperatures will near freezing (especially in Tipton County) and precipitation will diminish in intensity. This is when we could see some light freezing rain (if the surface temperature drops to 32), sleet, or light snow mix in with the rain. We call it "wintry mix" because it's darn near impossible to know what exactly will fall. It should all be pretty light though, with minor accumulation on grassy surfaces, exposed objects, and maybe some bridges possible, especially in Tipton County. By dawn, most precipitation will be over. After that, a bit of freezing drizzle or flurries are possible for a couple more hours but shouldn't affect morning church-goers or dedicated joggers. Overall, we advise a "wait and see" approach to those headed out in the early morning, but honestly, I don't really expect too many problems. A slippery bridge here or there, mainly north of I-40, is possible. With lows right at 31-32° and highs in the upper 30s, by late morning everything should be thawing and drying out. Starting Monday, a warming trend brings us back to near 50 by Tuesday with highs remaining in the 50s the rest of the week. Rain is a good bet Thursday and Friday with no winter shenanigans in view. Here's hoping for (and we're forecasting as of now) a dry and seasonal weekend next week! Get the latest updates on our winter weather threats via our Facebook and Twitter feeds, as well as the latest precipitation-typed radar loop, current conditions around the metro, and forecast in our mobile app. 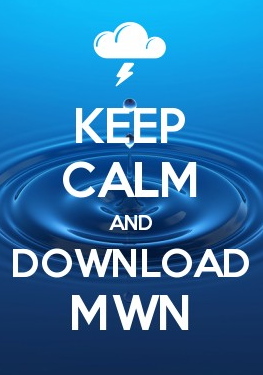 All links are below.